On the evening of the 8th August 2017, it was full moon and rangers at Sabie Sands heard gunshots around 18:00. Using the full moon for light, Dave Powrie went to investigate the area in a jet ranger helicopter. Dave and his team found an adult rhino cow, shot and dehorned. They continued on looking for the poachers. Using Thermal imaging, the team followed the month old calf all the way to Manyaleti to protect her from lions. Dave called MTPA officials in Manyaleti to help with the distressed female calf. 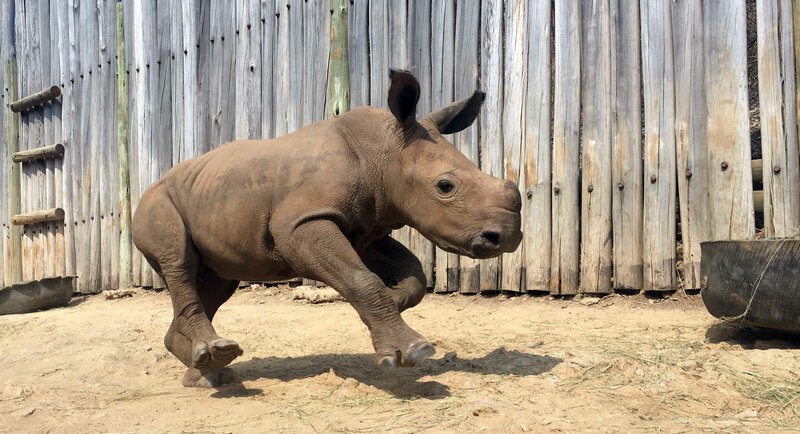 Around 21:00, MTPA officials also contacted Petronel Nieuwoudt at Care for Wild Rhino Sanctuary to inform her of an orphaned rhino in need of her help. Pilot Wayne Kenneth was contacted immediately and another Jet ranger was made available. With Wayne as the pilot, MTPA veterinarian, Dr Ferreira du Plessis together with Chris Hobkirk, left the Nelspuit airport and were airborne by 21:30. Dr Johan Marais, from Saving the Survivors, and his assistant Zoe, with the help of MTPA officials at Manyaleti, darted and retrieved the orphaned calf at 23:38. She was immediately taken to Dr Ferreira who was waiting at the Manyaleti helipad. By 23:42, Wayne and his crew, with the sedated calf on Dr Ferreira’s lap, were airborne and on their way back to Nelspruit. During the flight, Dr Ferreira was monitoring all the calf’s vitals. At 00:15 on the 9th August 2017, the calf arrived at the Nelspruit airport where Petronel and her team were already waiting. The calf was loaded onto Petronel’s lap on the back seat of a 4×4 vehicle and immediately headed off to the Rhino Sanctuary. Just an hour later, the calf, now named Rubybelle, arrived at the ICU centre of Care for Wild Rhino Sanctuary. The rest of the Care for Wild staff were already prepared for Rubybelle. Due to the cold winter night, the ICU room was preheated for Rubybelle. The team monitored her vitals endlessly. By 07:00 the same morning, Rubybelle had already drank 2 litres of milk and electrolytes. Three days later, Rubybelle was let out into the ICU boma for the first time. She was hesitant at first but then relaxed and she absolutely loved it. The next day she had a mudbath! The day after that, she was weighed (92kg!). A week later, Rubybelle was introduced to two other young orphans, Khanya and Rose. Despite their size and age differences (Khanya weighing over 300kg and Rose, over 200kg), Rubybelle stood her little ground and integrated with the big girls very well. We are happy to report that Rubybelle has been continuously picking up weight, together with other two orphans in her crash. We are happy to say that Rubybelle was rescued in record time and we would like to say a very special THANK YOU to all the people involved in her rescue. The quick response and caring hearts of all involved has helped to save another rhino.